As part of an op-ed series, FIU News shares the expertise and diverse perspectives of members of the university community. 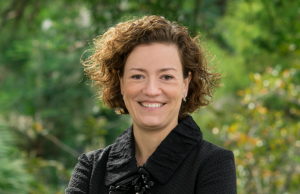 In this piece, Laura Dinehart, assistant professor and executive director of the School of Education and Human Development, offers her insight on the challenges facing public education nationally. This article was originally published Feb.24 on OrlandoSentinel.com. The opinions expressed in the piece are her own. 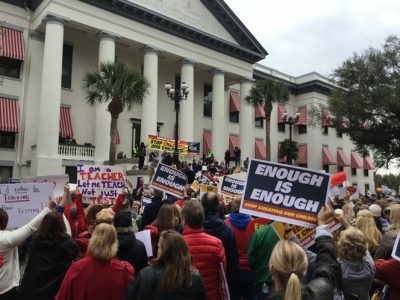 Teachers protest education policies at the Florida Capitol. When millions of Americans stood up in opposition to a person who will lead our nation’s education system — citing lack of experience and that person’s long-standing efforts to dismantle public education — we spoke with one voice. Yet 50 senators voted in a way that made so many people believe that no one was listening. Don’t feel helpless. The fight for our children and the future of education does not reside in Washington. Educators, school administrators, parents, students, local leaders and our communities must be the advocates, champions and protectors of education in this country. We are in this together and as someone who lives, breathes and is a product of public education, I have a few recommendations for you on how we can make a difference. I am a faculty member and administrator at a large public university. I work with hard-working faculty that prepare some of the most talented and diverse educators in the United States. I am a parent of three children enrolled in public schools and I am an alumnus of the same public school system my children attend. I am an alumnus of the public institution in which I am currently employed. Over the last few weeks, I have been inspired by citizens across the country who have advocated and acted together to support brilliant and conscientious students — ones who succeed despite circumstances that would typically deem them ineligible. They called legislators – when the lines weren’t busy – to remind them that the education of all students, including those with disabilities, is law. They wrote to remind their legislators that we expect them to support laws designed to keep students on college campuses safe from sexual assault. Now, they’re standing up for LGBTQ students’ rights in schools. What we’re seeing today is the culmination of an “education reform” movement that has moved money out of public education and demonized teachers. Yet, I am inspired and empowered by my fellow educators, parents and citizens who have chosen to fight for a basic tenant of education. Education is a right, not a privilege. So what now? How do we – educators, parents, citizens, and students – ensure public education remains a pillar of our democracy? I ask that everyone keep up the commitment to listen, pay attention, and demand that our legislators in Central Florida and the entire state, listen to their constituents who have come out to support public education. Call, write, and protest if you see educational rights dismantled. Visit local schools and not just the ones your kids attend. Listen to the voices of school principals, teachers, families, and community leaders. Support their efforts and ensure they are protected from those who aim to profit from education. Students, stand up! Legislators think you are asleep at your latest electronic device. You don’t vote, they say. Show them you care and tell them what you expect from them. Your voice matters. Educators, join your unions, and fight for what you believe in. Let your voice and expertise drive what we know is best for our communities. We have allowed various stakeholders to make decisions that fail to support what you work to achieve every day. You have a movement behind you. Capitalize on the groundswell of support. Change must come and it must come from you. We are with you. We are ready. This is a well-written article and teachers, students and staff should always remember that education is a right and not a privilege.